When food enters the stomach, your body responds by sending signals via hormones to the brain. The intricate circuitry between the gut and brain controls appetite and satiety. After a meal, levels of hormones such as CCK rise leading to feelings of satiety. Compared with lean subjects, overweight patients have lower post-meal levels of CCK: a possible explanation for overeating and reduced satisfaction after a meal. Studies have shown that levels of the appetite regulating hormone CCK remain suppressed even after weight loss. Reductions of this hormone can persist up to one year after weight loss, promoting increased appetite and decreased satiety; potentially leading to overeating and weight regain. 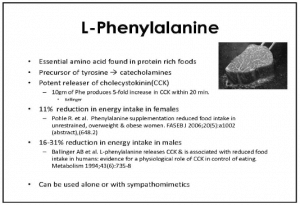 L-phenylalanine is a naturally occurring amino acid which has been shown to increase CCK. A double-blind study found that L-phenylalanine led to an increase of CCK levels by more than 5X base levels. There were no negative side effects. Furthermore, the L-phenylalanine group saw a significant reduction in caloric intake, giving evidence to the use of L-phenylalanine to control appetite, especially in cases where CCK production is otherwise suppressed.